1. Cut out your petals in the shape in the image shown on the left. 2. Pinching the curved edges of one petal together, thread your embroidery floss through the backside of the petal, this will hide the knot at the end of your floss on the backside of the finished flower. 3. Once secure, thread your floss through the pinched bottom of the front of the petal to secure the curved shape. 4. String the petal through to the end of your floss. 5. Repeat until you have enough petals for a full bloom. 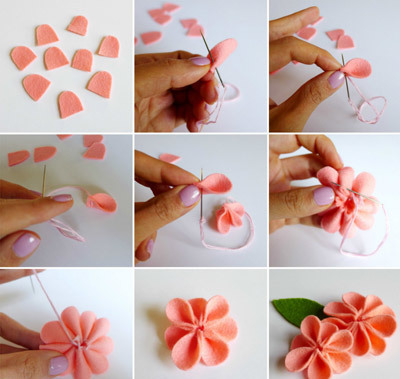 6.On the backside of the flower, criss-cross your thread to pull the petals together. 7. Tie everything off with a little knot and you’re done! Add a cut felt leaf for some extra flair.